The Big Boppa, our most popular bean bag chair, just got better! Three vibrant new colours have been added, so it’s easier than ever to find bean bag chairs that suit your tastes. The original line of Big Boppa large bean bags was available in four colours: blue, black, lime, and red. With the addition of orange, pink, and turquoise versions of this unbelievably comfortable chair, pinpointing the perfect option is a breeze. Whether you’re just looking for one chair or would like to mix and match a variety of bean bag chairs, you will love these stunning new colours. Although the Big Boppa is now available in three exciting new colours, it retains all of the features that made it so famous in the first place. In the world of giant bean bags, you can’t beat this remarkable product. It was inspired by our favourite children’s bean bag chair, the Freaky Cousin, but it is large enough for any member of the family. This beanbag is designed to hold 350 litres of bean bag filling, so you’re guaranteed to sink right into it and never want to leave. As with the original colours, the new colours can be screen printed for promotional purposes. As always, our colourful new Big Boppa bean bag chairs are made out of heavy-duty 1680D polyester. This material is strong enough to withstand practically anything, so you can safely use it even if there are pets or small kids underfoot. As a bonus, this particular polyester is also water resistant so that you can use the Big Boppa indoors or outdoors without any worries. Pink, orange, and turquoise are lovely colours to use outdoors or indoors, and they’re sure to add brightness and cheer wherever they’re used! 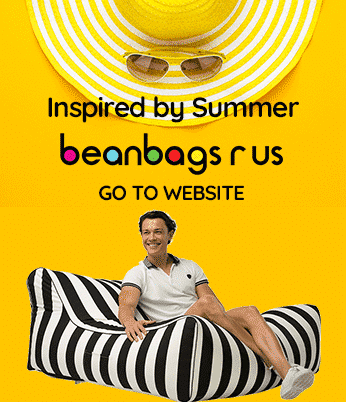 The Big Boppa bean bag chair is now available in seven stunning colours. You’ll be glad to know that you won’t have to wait long to start enjoying your new chair. Whether you opt for one of the original four colours or one of the three stunning new colours, you will enjoy fast, free shipping via Express Courier service. No matter where you are in Australia, you won’t pay extra to have your bean bag shipped to you. Once it arrives, purchase the appropriate filling at your local Target, Big-W, or K-Mart, and you’ll be enjoying your colourful new Big Boppa bean bag in no time.